For other uses, see Siyi (disambiguation). 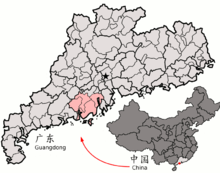 The Siyi (Seiyap or Sze Yup in Cantonese; Chinese: 四邑; pinyin: Sìyì; Jyutping: sei3 jap1; literally: 'Four Counties') refers to the four former counties of Xinhui (Sunwui), Taishan (Toisan), Kaiping (Hoiping) and Enping (Yanping) in the Pearl River Delta of southern Guangdong province, China. Xinhui is a city district and the other three are county-level cities, all four belong to Jiangmen prefecture administered from the city of Jiangmen. An alternative term, Wuyi (Chinese: 五邑; pinyin: Wǔyì; literally: 'five counties', in Cantonese: "Ng Yap"), which refers to the five former counties of Xinhui, Taishan, Kaiping and Enping as well as Heshan, all administered by Jiangmen, has become an official title, and is widely accepted by the local residents today. However, among overseas Chinese, the name Siyi (Cantonese: Sze Yup) is still popular and frequently used as Heshan County was established much later than the other four. It is said that over 100 famous people come from the Siyi or Wuyi region of Guangdong province, making the region famous for producing more entertainment stars than any other region in mainland China. As a result, the local government in Jiangmen which administers the Siyi or Wuyi cities of Taishan, Kaiping, Enping, Xinhui, and Heshan, decided to build a Stars Park called Jiangmen Star Park. The area gave rise to the Siyi dialects, the most prominent of which is Taishanese (Toisanese/Hoisanese). Although Siyi and Cantonese both belong to the Yue branch of Chinese, Cantonese speakers cannot easily understand Siyi dialect. In the late 19th century and early 20th century, many people from the Siyi (or Sze Yup as it was then known) emigrated to Hong Kong, Southeast Asia, Australasia, North America and South America. Of the Chinese American population from that time until the 1950s, Sze Yup accounted for the vast majority, about 80%, along with people from Sanyi (Sam Yup) and Zhongshan (Chung Shan). In America, people from Sze Yup generally worked as laborers; Sam Yup people worked as entrepreneurs; and Chung Shan people specialized in agriculture. The Punti-Hakka Clan Wars also erupted in the Sze Yup counties just prior to this time period of emigration. In 1851, two wuiguns (native place associations) were established in San Francisco: the Sze Yup Wui Gun and the Sam Yup Wui Gun. Endowed with only limited arable lands, with much of the terrain either rocky or swampy, Sze Yup was the "pre-eminent sending area" of overseas Chinese. In addition to being a region of major emigration abroad, Sze Yup is a melting pot of ideas and trends brought back by overseas Chinese. For example, many tong lau in Chokham and diaolou in Hoiping and Toishan built in the early 20th century incorporate architectural features from both China and the West. ^ Phonology of Cantonese - Page 192 Oi-kan Yue Hashimoto - 1972 "... affricates and aspirated stops into consonant clusters is for external comparative purposes, because the Cantonese aspirated stops correspond to /h/ and some of the Cantonese affricates correspond to stops in many Si-yi (Seiyap) dialects." ^ a b Pan, Lynn (1999). The Encyclopedia of the Chinese Overseas. Cambridge, MA: Harvard University Press. p. 36. ISBN 0674252101. ^ Hsia, Lisa (2007). "Asians and Asian Americans in the West". In Mancall, Peter; Johnson, Benjamin Heber (eds.). Making of the American West: People and Perspectives. ABC-CLIO. pp. 161–187. ^ Chi, Tsung (2005). East Asian Americans and Political Participation: A Reference Handbook. ABC-CLIO. p. 65. This page was last edited on 6 April 2019, at 09:30 (UTC).